On Sunday July 22, 2018, a group of GDA puppy raisers from Orange County had the privilege of teaming up with Adonai Families at their Back to School Bash in Rancho Cucamonga. The event hosted over 250 people whose lives have been touched by critical illness. Although the puppy raisers participated intending to bring joy to the lives of some very special families, it is safe to say that watching the children interact with the puppies brought just as much joy to their hearts as it did to the families who attended. Adonai Families is a non-profit organization that is dedicated to serving critically ill children and their families. They meet real financial needs of these families by providing food, clothing, and gas gift cards to ease the expenses associated with traveling to and from hospitals. In addition to meeting financial needs, they also do their best to meet some of the emotional needs of the families by organizing and putting on community events where families can come and make memories together as a whole family unit away from hospitals. With the help of monetary, in-kind and service donations, Adonai currently serves approximately 200 families, with more being added all the time. As GDA puppy raisers, our first responsibility is to our puppies-in-training. Each time we bring our puppies out for a socialization experience, we must consider whether this is the right experience for my puppy-in-training and am I setting him up for success? When first asked whether the O.C. puppy raiser group had any “puppies-in-training that could handle an experience of greeting between 300-400 adults and children, and would their raisers be willing to volunteer their time on a Sunday afternoon in Rancho Cucamonga?” I knew that we had several dogs that could handle the experience, and our puppies did not disappoint. 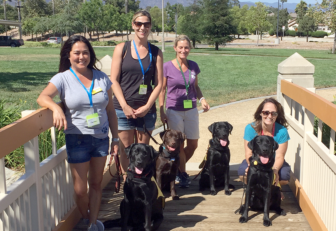 Each of the puppies-in-training who participated in this amazing event continuously demonstrated exceptional self-control and the ability to greet people in a calm, safe manner. Truth be told, our puppies-in-training certainly exceeded all of our expectations on that day. These puppies-in-training spent hours bringing smiles of joy to many children’s faces, and their families too. All present witnessed firsthand the precious connection between the kids and our puppies. There were truly special moments that touched not only the hearts of the families, but also the hearts of the puppy raisers. 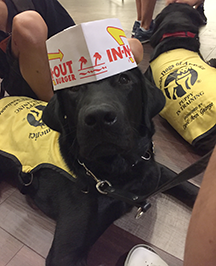 As a puppy raiser, and the Orange County Area Leader, I am exceedingly proud of the puppies-in-training that represented GDA that day. I witnessed puppies contorting themselves into awkward positions in order to let some of the children with special needs pet them comfortably. I watched a puppy lay his head down on his front paws and not move a muscle for several minutes while a child gathered up her courage to pet him. Between the puppy’s patience, and the child’s determination, they were both able to share a special moment together when she finally did feel brave enough. Each puppy was conscientious of the needs of the children and they spent the day intuitively shifting positions from sitting to lying down in order to accommodate each individual child. At the end of this incredibly inspiring, and touching day each puppy raiser left happy they came, and extremely proud of their dog. Together as a team, they brought smiles and happiness to each person they met; and in turn, they had a few new smiles of their own. The day spent with the Adonai Families was such a blessing. The O.C. GDA volunteers felt honored to have been invited, and are excitedly looking forward to the next event.